since posting about our floor renovations, i've had some questions as to how exactly i painted the floor. i'm going to lay out as best i can the steps i took. keep in mind, i'm not a professional and there may be better ways. this is just how i did it. above is a photo of the pattern i cut out of foam core (which i'll talk about it more detail below). i think it's beautiful just on it's own. unfortunately it doesn't exist anymore which is why i took the photo. as i got to the edges of the room i had to keep cutting it down until there was nothing left. sad, sad, story. start with a freshly sanded or smooth floor. when the refinishers sanded the maple floors, we had them do this room as well so i had a fresh palette to work with. i applied a single coat of primer to the floor to start. it wasn't a very thick coat, you could still see the grain of the wood through it. i scaled the pattern to the exact size i wanted it to be on our floor. make sure you have something in your design that you can use to line them up to create the pattern on your floor. for me, i could line up the dots from the previous flower to know exactly where the next one went. i purchased the largest size of foam core from hobby lobby and taped the printout to it. using an hobby knife, i carefully cut out the pattern. this is not easy, especially with a rounded design such as mine was. it would be much more simple with a straight-lined design. i chose foam core since it was a big project and i wanted something that would hold up to multiple uses. i was afraid matte board or the like would end up getting soggy. i measured my room to find the exact center and started there. depending on your design, this may or may not be the way you want to do it. for me, i wanted the design to run off the edges of the room from left to right, but then end short front to back, so this step was important. using a small artist brush i started painting in the stencil. again, i used glossy porch paint in white. for mine, it would definitely take 2 coats to get a solid color, however, we stopped at 1 because it was the look we were going for. after each flower, i would line the stencil up to determine where the next one went. having a floor with lines also helped ensure that i kept my stencil straight. if you did this without something that was lined, you might need to lay down a starting line to make sure your first one is straight. after that, if you line everything up they should continue being straight. that's basically it! one tip i would suggest: if you use foam core, coat the cut edges with a couple coats of paint. i found that once it got coated with paint, it smoothed out and took care of any little imperfections there were in my cutting. i hope that answers everything. if not, feel free to leave a comment. i'm happy to answer any questions! if you paint something, be sure to send me a link to some photos! i'd love to see! Thank you so much, Lori! I'm inspired to paint one wall w/ a pattern. . . I want it to look like walllpaper. I'll keep you updated! Thanks again for the breakdown of your procedure! that is absolutely, positively stunning!!!!!!!!!!!! nice job lady!! This is beautiful! I do have a question though... when your floors were being sanded, did the sanders have any problems encountering nailheads in the floorboards? Our floors are almost 100 years old, and were originally nailed down in places and I wondered if that would be a problem for the sanding machine? an answer to Jessie's question about sanding, yes nails typically are an issue for sanders. so you have to make sure they are driven deep enough they don't snag the sander or you have to remove them. and for Lori, love this project. i started painting my floors about 5 years ago when i got sick of all the dated carpet in our house but wasn't sure what i wanted to put down. 5 years later i still haven't covered those floors in anything put porch or left over paint (those little sample cans finally got used). i've been freehanding my patterns, but will remember your stencil idea for my next creation. How is the floor wearing? Do you think it may be a good idea to put another finish (like polyurthane) on top? Not sure what normally is done. Thanks!, though, they are beautiful! as for wear, we're actually planning on letting it wear a little because that's the look we want it to have. once it gets to a point where we'd like it to remain that way we're going to poly it. i would suggest a coat of poly right away if you want to keep it looking the same from the start. Gorgeous project! I am thinking of painting the old pine floors in my kitchen, as well as the wide plank floors in the bedrooms, and am wondering if any amount of poly will hold up to heavy traffic. I am a bit scared to start these projects, but seeing yours gives me courage! I absolutely love how these floors turned out. My husband would NEVER let me do this! Lovely... just lovely! You are a true pioneer of crafty innovation! Simply delicious and so adorable. Thanks for sharing! I love this design project, just beautiful!! Thank you so much for sharing your tips of the trade! What "name" color is the yellow/white porch paint? I love the look. Any way that you would post a download of the template you made for your floor? I am looking to do the same pattern on mine..
Hi Lori, this totally inspired me because our wooden floorboards are yucky to look at and not worth polishing, and with this method I don't have to learn how to lay down tile. I started researching stencils available in Australia and found almost the identical pattern to what you used (by accident). I want to do something similar but have no idea how to use Illustrator (I have a trial copy). Any tips on how to turn a small image into a big vector graphic, or did you start from scratch? So pretty! I know you said this yellow is discontinued at Home Depot, but do you still happen to remember the name of the color? Beautiful! so sunny and cheerful:) We are very inspired and would love to do something similar to our floors. I see you finished in summer 2009 so my big question is: Have you tired of the pattern, color, and boldness of it all? I think I would enjoy it for many years but would love to hear what you think of yours now that 2 1/2 years have passed. Home Depot now carries Glidden floor and porch paint in high gloss sheen. I'm using it on my kitchen floor right now. So far so good. Can you please share the stencil you used? I love it! I found it on the blog. I've been admiring your AMAZINGLY STUNNING yellow and white stenciled floor for some time now and wanted to let you know that I used the pattern you so generously shared to stencil a border around a bedroom floor. I LOOOOVE the pattern and was dying to use it and finally got my opportunity. My son moved out of my house :( and I went to redo his bedroom and ripped up his wall-to-wall carpeting to find hardwood floors that were in desperate need of some TLC, mainly around the borders, after years of drinks being spilled, etc. water stains galore. I didn't have the money to refinish them so I thought: I'll paint a border and stencil it with Lori's awesome pattern. I blew up your pattern at Kinko’s and ordered stencil paper online, cut it with an x-acto knife and rolled it on, touching it up with a fine brush after. Is there a way for me to e-mail you a picture or two? I feel I owe that to you if you'd like to see what you've inspired someone out there to do! Let me know. I searched high and low for the perfect pattern for my floor and simply could not find anything I loved except for yours. THANK YOU FOR THE INSPIRATION AND GORGEOUS DESIGN!!!! That is 10x better looking than the carpet you previously had. I’m glad that you decided to scrap the carpet for that wonderfully painted floor! What I like even more though is the step by step guide that you’ve given! This will surely help me in my future projects regarding painted floors. Thank you! 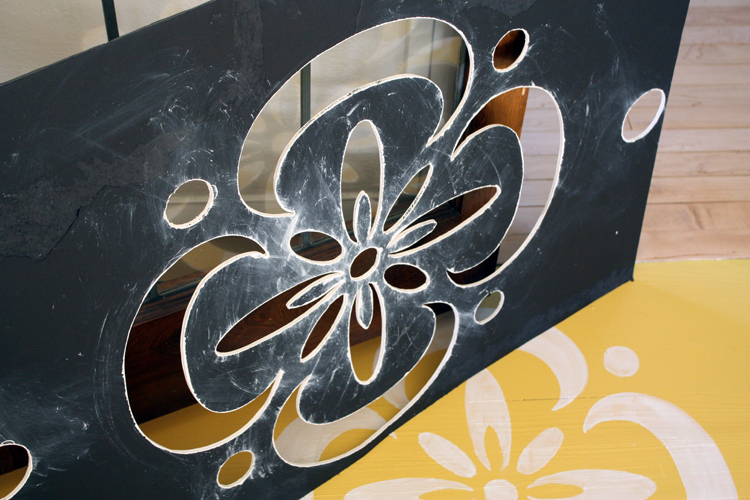 I am looking for the stencil for this flower and see it is somewhere on the blog? can you point out where? thank you!